This summer, we chose the Northern Sporades in Greece as our new cruising destination in the Mediterranean. One evening, we were watching the musical film 'Mamma Mia'. The setting of this cheerful movie are the Sporades. We knew we had to check these islands out. If you haven't seen the movie, then do it now! You'll love the ABBA music and the whole sunny setting of the movie. Anyway, this year, we explored the Northern Sporades and what a beauty they are! 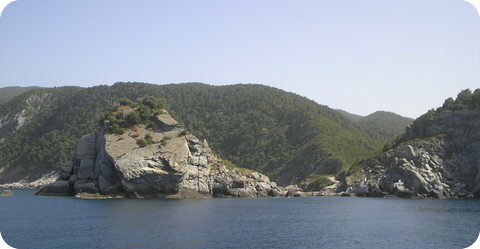 The Greek Sporades are a group of islands north-east of the Greek mainland. The islands are mountaineous, green, still very unspoiled and you'll find some beautiful wild animals around. We started our trip from Zea Marina in Athens, a good place to start if you want to provision properly. Bread, fruit and vegetables you can find in the little supermarkets on the islands, but for serious shopping you need to go to a bigger place, like Athens. 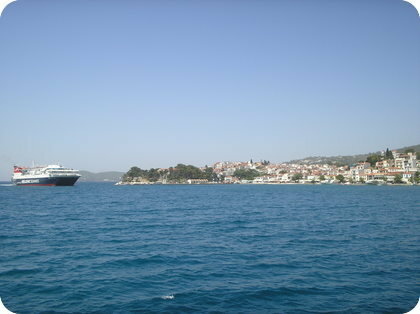 We started off with the most western island, Nisos Skiathos. 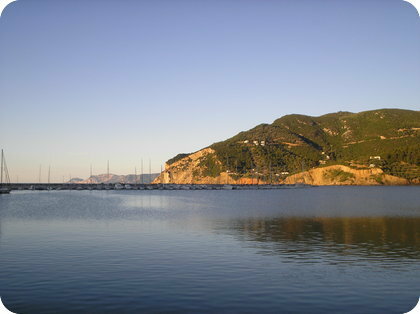 It's very close to the Greek mainland and that's probably why more tourist come here. Big and small ferries visit the harbour regularly. The town is pleasant and lively and it's a good transition to the quieter islands more east. When you're going around the island, you will not find a huge holiday resort or a completely spoiled town. If there is a bigger hotel, it still blends in well with the environment. 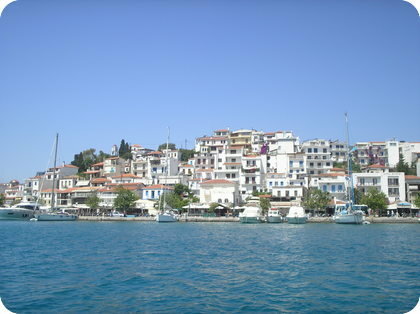 Going to Skiathos town, we anchored in the big triangular bay which gives you good holding and protection. You can tender in easily, so that's all fine. The only thing you have to look out for is the exlusion zone in the bay. At the end of the bay is the runway of the airport of Skiathos. It's well marked on the chart, not really in the bay itself, but it's pretty obvious that you don't want to anchor with a tall mast in front of the runway. There's plenty of space beside the exclusion zone. The wind is most often from the north-east or the south-west, exactly the direction in which they build the runway. 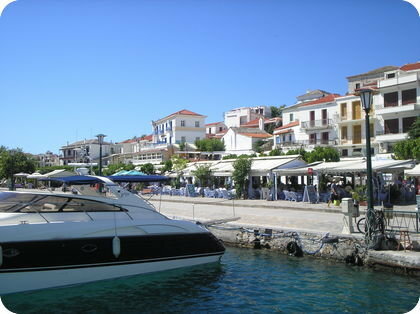 Skopelos town (Limin Skopelou) is a very cosy place in the Northern Sporades. You will find a nice authentic village with lots of good restaurants. We enjoyed the relaxed atmosphere here and I'm sure you'll enjoy it too! 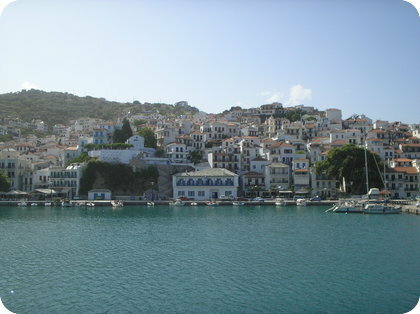 Skopelos harbour is well protected and the locals are very welcoming. 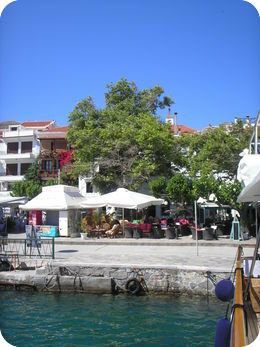 We managed to get a berth just in front of the lively part of the village. On the picture above, you see how many yachts they can put stern-to on the breaking wall. You will have to drop the anchor though, since there are no ground lines. Nice restaurants in a colourful setting! We passed this possible overnight stay, located in the south-west of the island, because there were too many sailing yachts already. Instead, we went on further north, where we did spend the night. The area here is also mountaineous, so you can have strong gusts through the valleys. Anyway, we chose to anchor and put a stern line to a strong big tree. Three hours later we experienced some strong gusts on our starboard side, which was still okay. But, after 15 minutes or so, we got hit by even harder gusts from the complete opposite side. To be safe and to get a night with sufficient sleep, we let the stern line go and stayed anchored in the middle of the inlet. We picked up our stern line the next day. No problem. Now, if you anchor here with a stern line, try to go deeper in the inlet, so that you don't have to anchor too deep for your yacht. Make sure your stern line and anchor chain are really tight! The green setting around the anchorage is really pretty! Being inspired by the 'Mamma Mia'-movie, we had to find the chapel which the movie makers used for the final scenes. 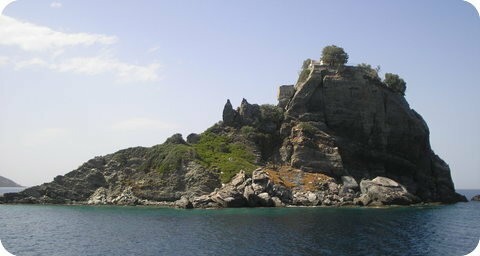 The rock on which the chapel is built, is called Ak Kastri and is located on the north-east side of the island of Skopelos. Once you managed to climb up all the steps to the top and you rang the bell hanging next to the chapel, you are treated to a magnificent view! We anchored just south of that rock, where there is a nice beach, by the way. 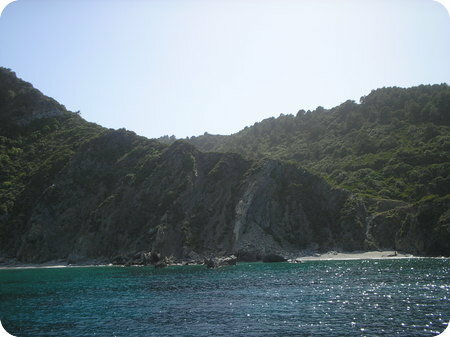 Go to Cruising the Northern Sporades Part II.